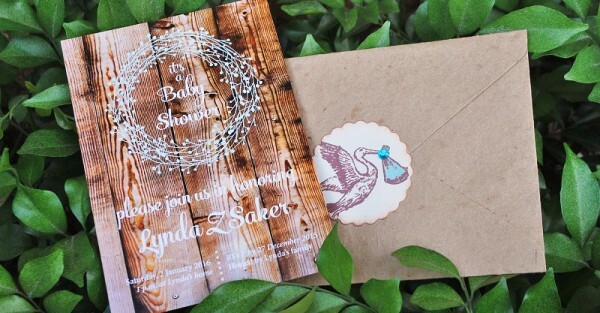 When Lynda’s family heard she was expecting a bouncing baby boy they couldn’t wait to celebrate by throwing her a beautiful baby shower, one with an exquisite rustic baby shower theme. With this much attention to detail it’s no wonder it was a few months in the planning, but the results speak for themselves! Come take a look at their brilliant ideas. 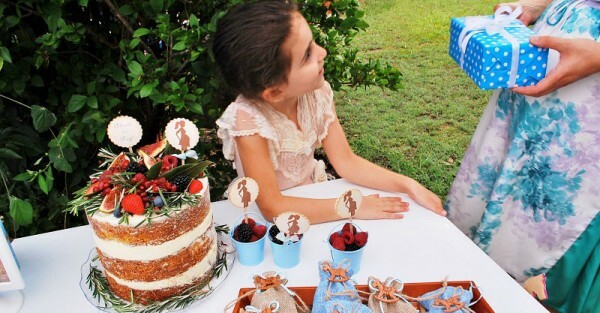 They scoured the internet for the perfect designers and found the talented Whitney from Jitneys Journeys on Etsy, who helped them create the beautiful woodsy invitations. To add the perfect finishing touch to the envelopes they asked Kelli from Seasonal Delights Baby to create the adorable personalised envelope seals. 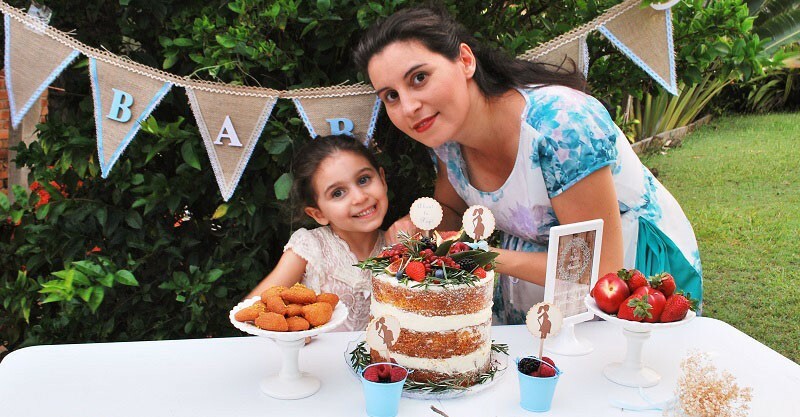 She also helped out with the elegant cake toppers, whilst Lynda’s talented family made all the delicious treats such as the almost too beautiful to eat orange Madeira deconstructed fruit cake and traditional sweets. The whole family was very excited to meet this little guy so it was important to have a touch of blue. Lynda’s family ensured this came through in all the gorgeous details such as the exquisite hand made bunting they made especially for her and the cute blue hued favour bags. On the big day it was all put together with a little help from Lynda with the styling. Looks like there’s some talented design genes in this family! 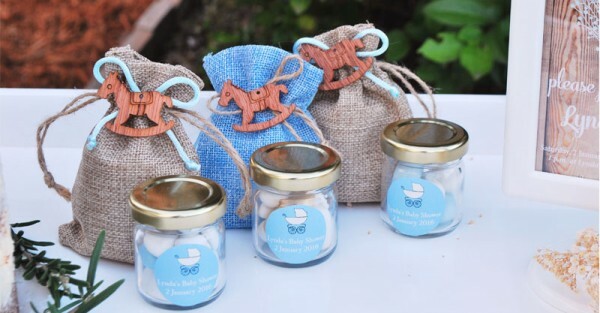 The cutely coordinated small round jars and hessian bags were a sweet touch, organised through Kelly Beans Bombonieres. The personalised label stickers were printed in a jiffy by the team at Vistaprint. Truly a party fit for a little prince and a wonderful way to welcome him into the family with impeccable style and oodles of love! 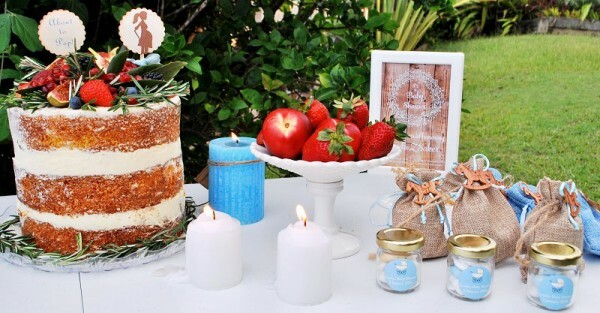 Do you have a beautiful baby shower to share? Then just fill in this form on our contact us page. While we can’t reply to every email, we’ll certainly let you know if your party is chosen to be showcased on Babyology. 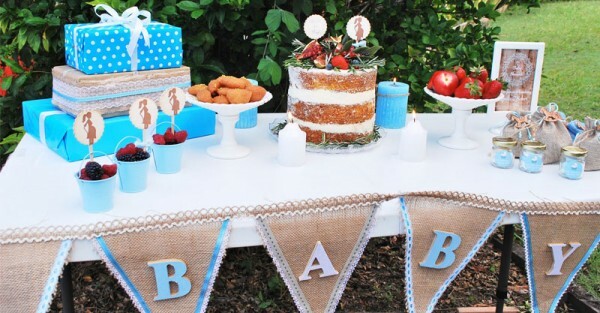 We can’t wait to hear from you and look forward to seeing your amazing baby showers!